When I was fourteen, about a year after being assaulted by a volleyball coach, a feminist teacher introduced me to women’s poetry. She gave me Adrienne Rich and Ai; Sylvia Plath and Audre Lorde; Nikki Giovanni, Rita Dove, Erica Jong, and many others. Unknown to me at the time, Mrs. Charles was dying of breast cancer, and gave no more fucks about holding back on anything. That’s when I “got woke,” in millennial parlance. I discovered the Riot Grrrls and moshed my heart out. Years later, I duct-taped myself to friends and got tear-gassed in the Seattle WTO protest and learned to teach women’s self-defense. The book opens by honoring the generations of women who came before, mothers of the revolution, among them Geraldine Ferraro, who appears in Anne Babson’s “Geraldine Ferraro has blood cancer,” as well as Indira Gandhi, Bettie Page, Oprah, and Katharine Hepburn (for whom I was named). gets carried away and lights her up. as flames surge up her bare, unshaven legs. Contrary-Mary remains the rebel, even in the face of her own demise. This book is so many wonderful things, yet some things it is not. For example, it’s a rare poem in this large anthology that grapples with the intersection between sexism and racism, or between sexism and classism. Loving women has a good deal of representation, and crossing gender boundaries has some. I love Rage Hezekiah’s “Full Belly Farm,” in which a woman is teased about being gay, then eats a worm to prove she’s macho enough to do field work among the men. 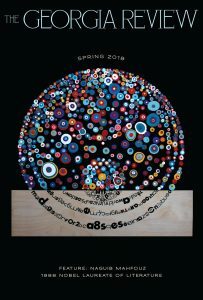 Cultural and racial diversity have some representation here, but not nearly as much as they should; class takes a token seat at the table, particularly in the poems about work. Do these complaints mean I think we should toss out Nasty Women Poets? Not at all, but I hope the next feminist anthology can expand previous definitions of what it means to be feminist. The time has come for more third-wave white feminists to put themselves in the back seat and let art by women of color take the lead. red velvet proofs deep in my solar plexus. burning inside to rise, rise, rise. Another powerful and unique piece taking on police violence against black people is “Digital Anthropologists Find Our Hashtags” by Nordette N. Adams. The poem opens with “Dear #AltonSterling, Your face reminds me of my brother.” Then, Adams develops imagined social media exchanges responding to police shootings of unarmed black men, including Alton Sterling, Trayvon Martin, and Philando Castile—bringing real lives and new media into the poetic form. Despite the evocative poems quoted above, the other thing I struggled with in this anthology was its unevenness in poetic skill. Some might think poetic skill is subjective, but I believe we must acknowledge there are varying degrees of virtuosity. Yes, there are schools of thought and taste, but awareness of the music, the form, the image, and the story (if there is one)—as well as knowledge of how to choose the tools in the toolbox—are the fundamental elements of craft, and many of the Nasty Women poets seem to lack even the right hammer and screwdriver. Too many of these poems move doggedly toward predictable punch lines, something I see a lot in novice poetry. In some cases, I could almost hear the “bu-dump-bump” cymbal crash after the final line. But there are certainly poets here who have a handle on craft, who develop lines that sing with sound, image, and surprising leaps. Perhaps some readers will think me anti-feminist for making these criticisms, but I offer them to be respectful of poetry as an art form and of women as capable human beings. If I were still teaching poetry, I ’d pick and choose from this anthology to teach craft; if teaching women’s studies, I might assign the whole book. 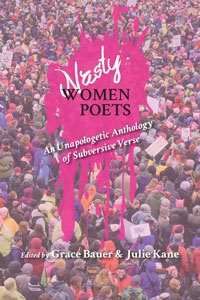 This anthology can help bring the gifts of both feminism and poetry to new readers, and can energize us to come together to make art political and politics artistic—despite our many imperfections.